Behind every manic Kickstarter, game expansion, and exciting retail news, there comes a lot of…prep. Yes; once the first Kickstarter was safely shipped and in every backer’s hands in January, we were busy road mapping. It was around this time exciting retail things began bubbling (we first met with to begin Apple Store discussions! ), including Battles work. 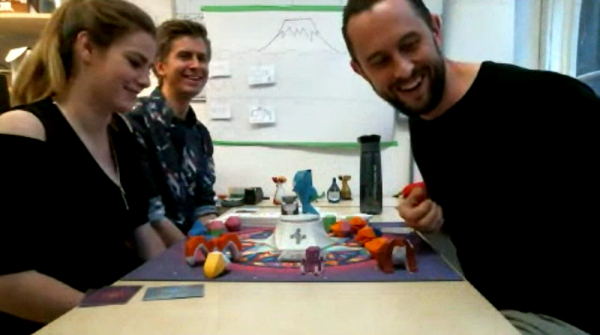 This involved a lot of work figuring out how competitive play will work with Beasts of Balance and playtesting early prototypes. Battles went through a lot of spurts and starts during that period. To get an idea of just some of the concepts we toyed with: cards with multiple powers, cards with blood prices, different scoring mechanisms, owning your own beasts…let’s just say Battles went through a lot of iterations to get to where it is today! A few of our older card designs, which had dual actions and activation costs. On top of that, we went to a whole bunch of events and conventions. 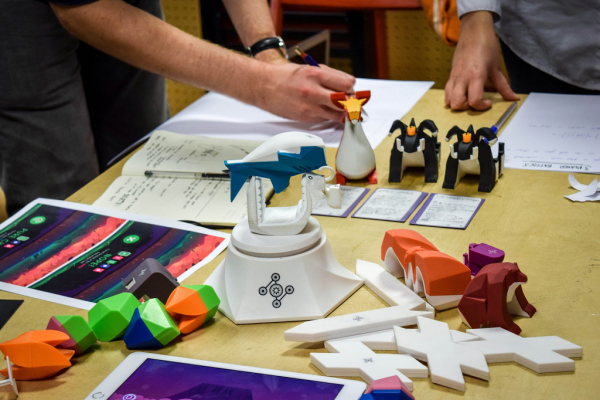 To be honest, we’d almost forgotten how many there were until we started digging through our archives to make this post: Nuremberg Toy Fair, Spielwarenmesse, Geek 2017, GDC, Toy Con UK, SXSW, Maker Faire…between giving a couple of talks, demoing our shiny new game, and seeing other incredible games and creators, it was a fun start to the year. That window of time from the 11th of June to the 8th of August was intense. 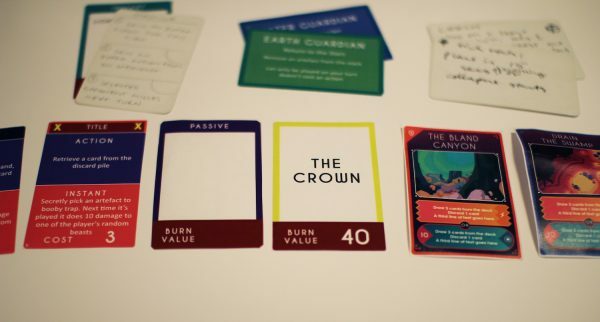 It was also amazing and heart-warming to see how many backers were returning from our first Kickstarter, as well as new people coming along for the ride. 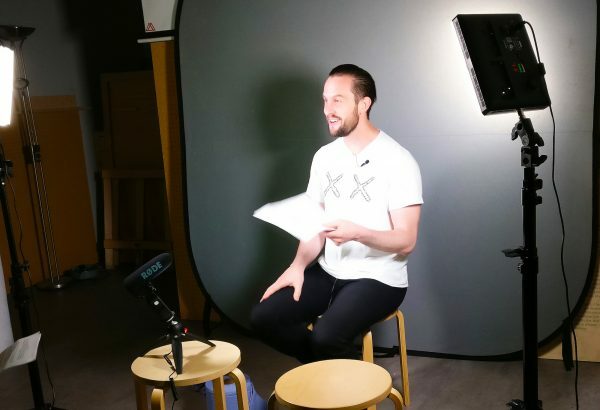 Between shooting the Kickstarter video (with the incredible help of Matt Lees from Shut Up and Sit Down), making our first attempts at Kickstarter Live, planning and scoping Stretch Goals, and more, it was a tiring experience, to say the least. Tim filming *exciting* things for our Kickstarter video. But with such brilliant backer support behind us we funded and then some, which left us exhausted but excited, happy in the knowledge that Battles was definitely now going to be a thing. Once we’d allowed ourselves a day or two to catch our breath, we dived straight into making Battles. It turns out that prototyping new beasts, finalising card designs, working on card and artefact functions, and iterating on overall gameplay, is pretty time consuming! Luckily we’ve had great help from our community in playtesting, and stellar collaboration on animation, sound design and more. Together with the dogged work of the team, we’ve made some leaps and bounds in getting Battles ready. We have physical, tangible new beasts and legendaries. We have new tricks for old pieces. We still have a ways to go polishing the expansion up, but we are really pleased with how Battles has shaped up so far. We can’t wait to send it off into the wider world and see it being played by others in the near future! In October, we had the slightly surreal experience of seeing Beasts of Balance in the Apple Store. Happiness is many things – including holding a box of Beasts of Balance inside the Apple store. Without being too, too dramatic, it felt like a momentous occasion. In 2016, Beasts of Balance was simply an idea we hoped would flourish into a real game. Would we fund our Kickstarter? What would happen after that? What if it turned out people weren’t all that crazy about worlds full of funky creatures? To go from that to seeing our game in the Apple store was a big deal for us. 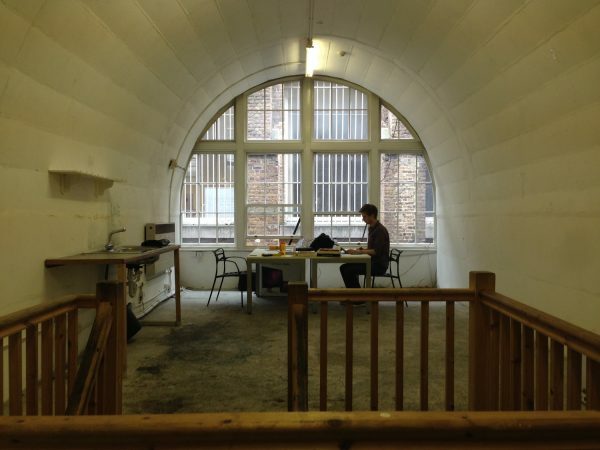 We’re still a pretty small team, working in the vaults under Somerset House. But now we have a game that people around the world can buy. In the Apple store. So, yeah. That was cool. In the midst of the Kickstarter madness, another new exciting project was beginning to bloom across the pond. 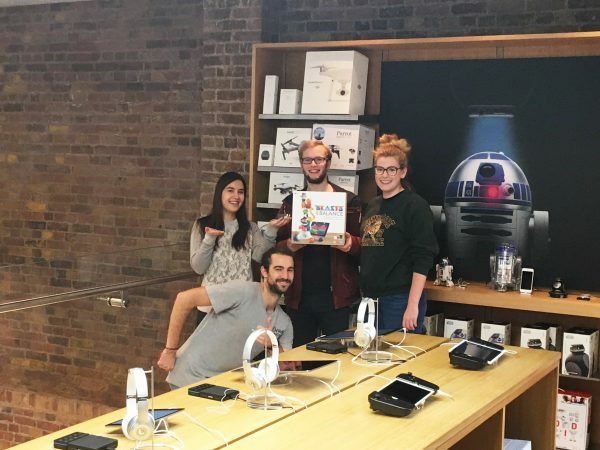 Our founder Alex worked with a super team in Seattle to take part in the Amazon Accelerator project, developing a Cool New Game that worked with Alexa. Many ideas were discussed and worked on. It was a very frantic few months. But by the end of it we emerged with Voice Originals, and the first game that would be in that series: When in Rome. 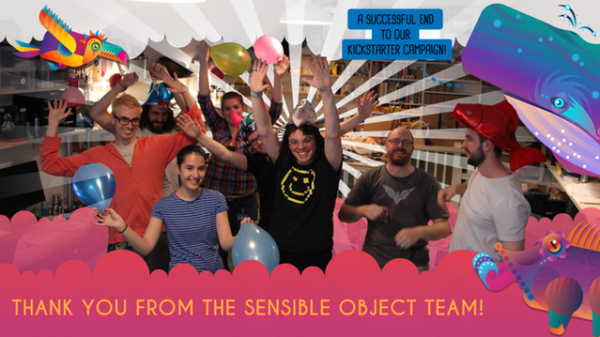 So, now you’re all caught up on what happened with Sensible Object this year. It’s been a rollercoaster ride and a half, but we’d definitely do it again (after a little breather). You may have seen new faces creeping up in our videos and photos. 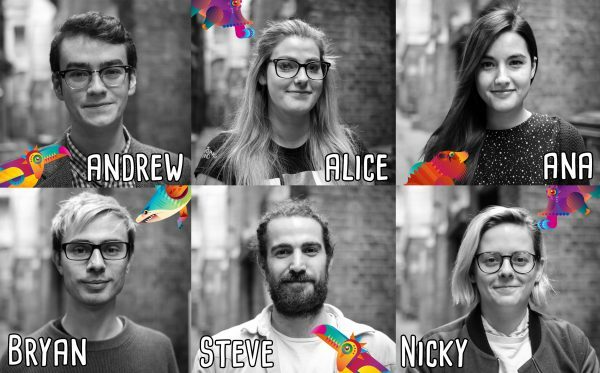 This is because we have, in fact, acquired some new team members! They’re lurking in the background, helping code Battles, shaping up the new beasts…possibly even writing some of the content on this blog. Luckily they’re all appropriately weird and fabulous (if they do say so themselves! ), so they’ve fit in pretty well. The studio getting a makeover! What with all the new faces creeping in and taking up space in the studio, we had no choice but to give it a makeover. It’s now a lot cosier. 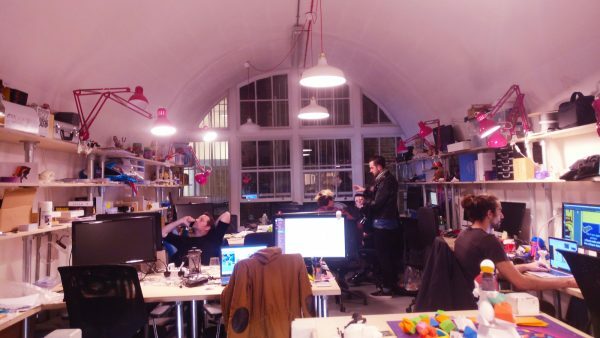 It’s now also got *mood lighting* – and a neat little fold-out work area for working on Beast prototypes (though we’ll be honest, it often gets covered with random artefacts/mugs of tea). Chris, our Lead Engineer, is actually quite good at being an Engineer. Who’d have thought! Okay, it turns out quite a few people would have. Not only was he listed as one of the Bright Sparks by Electronic Weekly Magazine, he also won Young Engineer of the Year Award from the Royal Academy of Engineering. We’re almost glad he didn’t win anything more, or else we’d have to dedicate a separate blog post to him…(Of course, we’re kidding – a well-deserved congratulations to Chris!). Babies being Adorable with a capital A! 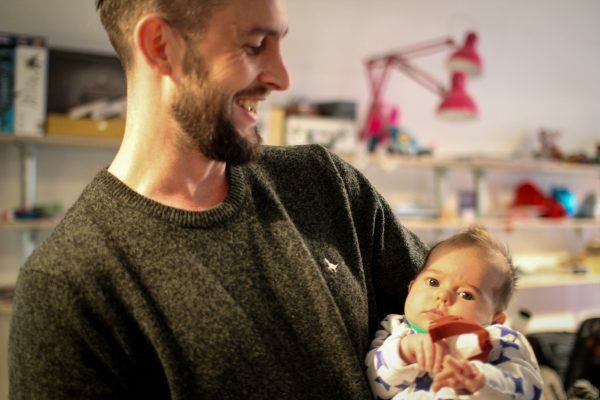 Finally, to end on an absolutely adorable note: as of September, our Lead Designer Tim is now a father! Eris graced us with her presence in the studio in November, and needless to say, hearts were melted. And now, thanks to this photo, yours probably is too. You’re welcome. Thanks everyone who joined us for this journey of a year. Onward to 2018!